Cherry Wooden Dress Hanger - 17"
Upgrade the hangers in your store for a more reliable and economical way to create merchandise displays. These sturdy wooden hangers will add an element of chic fashion to your collection of essential store supplies. Available in a rich cherry color, these 17" dress hangers will complement any size or style garment with a warm feeling of nobility. The notches on the hanger will help to securely fasten the clothing for an appealing drape. Additionally, each hanger features a metal swivel hook for added durability. 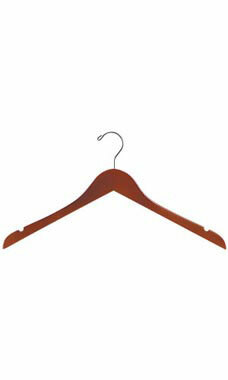 Sold in cases of 50, the wholesale wood hangers are in stock and available for immediate shipment. I am was very excited when I received my new hangers. My store took on a whole new appearance. I gave it an elegant and quality look. Very impressed and pleased with the hangers. I love these hangers. The Cherry color looks so good with my wedding dresses in my store. Love the prompt shipment on the products also. Very nice hangers, they add a classic touch to my boutique. Hangers are beautiful in color and are good quality. I always buy these when I need hangers. Hangars feel good in my hands. Nice weight to them. Color was not what I anticipated.